Stairway training shop provides a wide range of interactive learning and development material aimed at improving individual, team and business performance. From icebreakers to team building activities, Stairway material is easy to use, convenient and re-usable. There is no licence fee to pay and many of our products are downloadable, giving you instant access to tried and tested training material. With over 20 years’ experience in the global business and learning and development arena you can be sure our products are well-produced, business focused and of top quality. 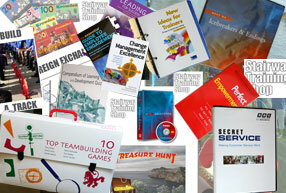 Our books, toolkits, business games, simulations, and icebreakers are written for managers, trainers, facilitators and consultants to help develop leadership skills, promote teamwork, improve customer service and enhance personal effectiveness. All Stairway material is practical and interactive. Our activities, icebreakers and toolkit exercises encourage people to learn in a participative manner. Whilst much of our learning and development products are fun to use, they have a serious side as well. We provide full debriefing prompts and summaries of key learning points in order to allow learners to put theories into practice, to reflect on what they have learnt and to transfer the learning to the workplace. We also design tailor-made learning and development material ranging from business simulations to team building games and activities that we can customise for your organisation. Email info@thestairway.co.uk.